You spent several hours to prepare the data for your Line-Chart. Designed the Line-Chart on a Report with Title, Data Labels, Legends and it looks nice except one big problem with the Profit/Loss line. 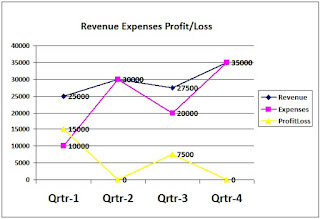 The Line doesn’t show up on the graph except two marker points on Qrtr1 and Qrtr3 values points and nothing shows on Qrtr2 and Qrtr3 value locations. Did you notice where the actual problem is? In the Profit/Loss row, in Qrtr2 and Qrtr4 cells have Null values in them resulting the Graph Chart to ignore these cell values and not connecting other values with lines, without breaks in between. 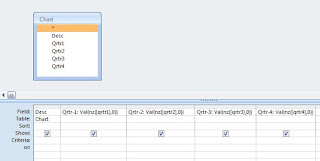 While preparing data (source Table/Query) for the Graph Chart ensure that none of the cells end up with Null value. If there are Cells with Null values then fill them up with Zeroes. 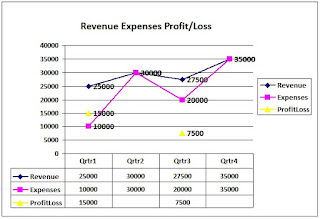 The corrected Chart Table, filled with zero values in empty cells resulted in connecting the points with line correctly on the Graph Chart image shown above. 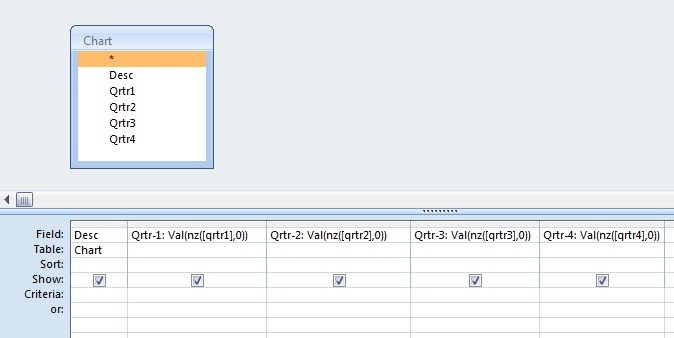 You can modify the Chart Source Value by modifying the Row Source Property SQL value, without directly updating zeroes on the Source Table. Open the Report with the Graph Chart in Design View. Click on the Chart’s outer frame to select it. Click on the build (. 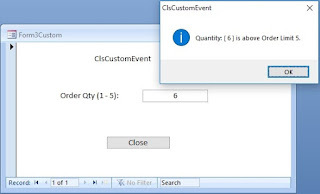 . .) button on the Row source Property to open the Graph Chart Source Query in Design View. 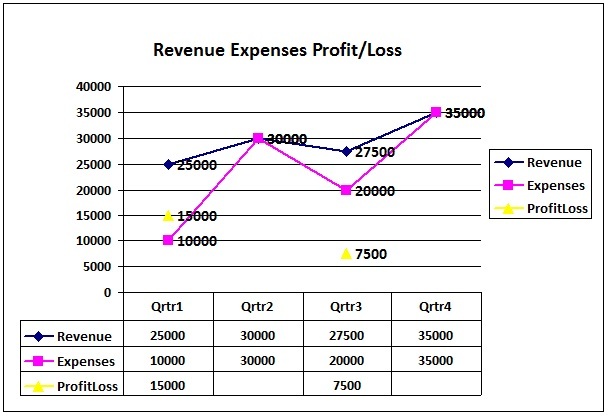 Open the Report with the Graph Chart in Print Preview mode to view the effect of the change.